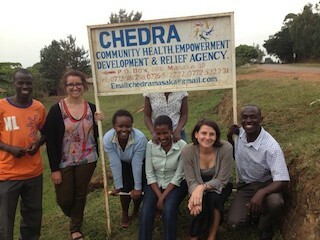 Moses (right), the head of CHEDRA with some of the team and volunteers. CHEDRA has been a partner of the Uganda International Marathon from its very onset and the organisation does incredible work with its vision “To see a prosperous and healthy community in southern Uganda.” With a focus on HIV prevention, CHEDRA looks at elements that affect those infected and affected by HIV. A major issue that falls under this category is that, as parents are taken by HIV/AIDS, children are forced to drop out of school. Not only does this cause high unemployment rates, but children who have had to drop out of school are more vulnerable to young pregnancy, child marriage and contracting STI’s. CHEDRA are looking to create a sustainable income generator that will give opportunities to vulnerable youth community members, and with 52% of the Masaka population being classed as a youth it’s a big task! To support 50 girls to re-enter the educational system and gain vocational skills by the end of 2019. Provide free ITC and computer training to 350 vulnerable youth, of which 60% are school dropouts or at high risk of dropping out. Your fundraising will go directly to establishing the first community resource center in the parish of Ssaza, just 5 minutes from the Athletes’ Village in Masaka. This resource center will be furnished with 12 computers, a photocopier, scanner and a full-time staff team, selected from CHEDRA beneficiaries. If we hit our target, CHEDRA will be able to buy a property outright, which means no continuous renting costs. The project will be sustainable by charging members of the community to use the internet and stationary items so that CHEDRA can offer free services to their target beneficiary base of youths between 15-25 years of age. All profits from the project will then be used to fund CHEDRA’s mobile HIV prevention team that conduct targeted testing and counseling at a door to door level. The impact of this project is set to grow year on year!! Jane, 14, has been supported through CHEDRA’s HIV outreach activities to attend school. She is currently in her last year of Primary school, is head girl and a recognised character in the community. This is amazing enough, but when you consider she has been deaf and dumb her whole life due to her mother having contracted HIV while she was pregnant. Jane has had to overcome both the stigma of having the virus and her disability. She is a remarkable girl!